Polycelis felina, a freshwater planarian. Image: Eduard Sola, Wikipedia. The discovery, published in the Proceedings of the National Academy of Sciences, may shed light on the possibilities of alleviating ageing and age-related characteristics in human cells. Dr Aziz Aboobaker from the University's School of Biology, said: "We've been studying two types of planarian worms; those that reproduce sexually, like us, and those that reproduce asexually, simply dividing in two. Both appear to regenerate indefinitely by growing new muscles, skin, guts and even entire brains over and over again. "Usually when stem cells divide  to heal wounds, or during reproduction or for growth  they start to show signs of ageing. This means that the stem cells are no longer able to divide and so become less able to replace exhausted specialised cells in the tissues of our bodies. Our ageing skin is perhaps the most visible example of this effect. Planarian worms and their stem cells are somehow able to avoid the ageing process and to keep their cells dividing." One of the events associated with ageing cells is related to telomere length. In order to grow and function normally, cells in our bodies must keep dividing to replace cells that are worn out or damaged. During this division process, copies of the genetic material must pass on to the next generation of cells. The genetic information inside cells is arranged in twisted strands of DNA called chromosomes. At the end of these strands is a protective 'cap' called a telomere. Telomeres have been likened to the protective end of a shoelace which stops strands from fraying or sticking to other strands. Each time a cell divides the protective telomere 'cap' gets shorter. When they get too short, the cell loses its ability to renew and divide. In an immortal animal we would therefore expect cells to be able to maintain telomere length indefinitely so that they can continue to replicate. Dr Aboobaker predicted that planarian worms actively maintain the ends of their chromosomes in adult stem cells, leading to theoretical immortality. Dr Thomas Tan made some exciting discoveries for this paper as part of his PhD. He performed a series of challenging experiments to explain the worm's immortality. In collaboration with the rest of the team, he also went some way to understanding the clever molecular trick that enabled cells to go on dividing indefinitely without suffering from shortened chromosome ends. Dr Tan pointed out the importance of the interdisciplinary expertise: "It was serendipitous to be sandwiched between Professor Edward Louis's yeast genetics lab and the Children's Brain Tumour Research Centre, both University of Nottingham research centres with expertise in telomere biology. Aziz and Ed kept demanding clearer proof and I feel we have been able to give a very satisfying answer." Dr Aboobaker concluded: "Asexual planarian worms demonstrate the potential to maintain telomere length during regeneration. Our data satisfy one of the predictions about what it would take for an animal to be potentially immortal and that it is possible for this scenario to evolve. The next goals for us are to understand the mechanisms in more detail and to understand more about how you evolve an immortal animal." Professor Douglas Kell, BBSRC Chief Executive, said: "This exciting research contributes significantly to our fundamental understanding of some of the processes involved in ageing, and builds strong foundations for improving health and potentially longevity in other organisms, including humans." Our data satisfy one of the predictions about what it would take for an animal to be potentially immortal and that it is possible for this scenario to evolve. The next goals for us are to understand the mechanisms in more detail and to understand more about how you evolve an immortal animal. Surely the researcher is confusing terms here. 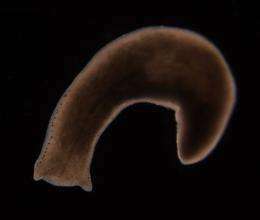 Is "evolution" a planned thing or is the researcher saying that they'd like to know how it is that the planarian just happens to have none-shortening telomeres, i.e. how did they get to that state from some other non-ideal state via the process of "evolution"? So in a couple tens of millions of years these will be the ancestors of elves! Seriously though, there is a lot of possible connections between the advantages of sexual reproduction and generation-churn that seems to bias against immortal individuals. In the meta view, many species as a whole are "immortal", were just stuck in a reductionist view point of an individual. I'll play the devil's advocate and say that although it's nice to be immortal but at what cost in terms of world population. Eventually if no one dies the population will outstrip food sources as well as other natural resources such as land. All those extra people will produce more carbon dioxide which traps heat. Are we as a society going to stop the progression of this research when we find out how to stop cancer? When do we stop? Once again, kevin unsuccessfully tries to make trouble surrounding evolution where there is none. The consequences of modern medicine are never debated and need serious attention. People living a couple of hundred years is not that far off. The implications are staggering. It's just a matter of time before scientists develop the elixir that elongates human lifespan. I see these advancements as a fulfillment of visions of the nightmare future described by screenwriters- Sprawling cities with mile-tall, twisting into-the-sky high-rises, where its residents are armed to the teeth and barricaded in, except that instead of guys that look like Clooney or Crowe wielding the automatic electro-magnetic pulse weapon, it'll be thousands upon thousands of great-grandpa-looking geezers. Unless of course, this elixir keeps you looking like the rake you were in college. Then, gentlemen, count me in. Tausch got it right -cancer is the enemy of very long-lived individuals. And among higher vertebrates, we have the problem of dementia. Unfortunately conserving telomere length does not confer immortality in humans. There's a reason that telomeres grow shorter when dividing and, when too short, initiate planned cell death (apoptosis). Cells accumulate damage in the DNA (through copy errors when dividing, mutations via radiation, and exposure to chemical/bacterial mutagens). These mutations get passed on upon division. So it's in our interest that cells that are likely to be non-functional die. Cells in the human body where, through some defect, telomeres don't shorten, eventually become immortal and non-functional have a name: cancer. When they mention evolution, it may mean they are doing an artificial evolution experiment in their lab. Planarian worms are small enough for it to work in an artificial environment in the laboratory. Hmm antialias, what then is the purpose of stem cells that give rise to your germ line? You'd better believe that those cells, too, are immortal, or else you would be the last antialias to roam the Earth. While stem cells are much more slowly dividing, they are in fact immortal. I would like to know how many divisions these worms went through and how long they actually carried out the experiment on a single line of worms? This is interesting. Sometimes when you ask, should humans live forever, the response is no, we won't have room, we'll be overcrowded! Well, here is a species that lives forever, and yet has managed to not decimate the earth by overpopulation. This species has predators. What's a human predator? Don't worry. Sooner or later, nature will reach an equilibrium. War always was and always will be. The immortals cannot survive a bullet. Imagine combining this with a virus. Vampires might become a reality. Or zombies ala resident evil. War always was and always will be. War has never significantly affected population numbers (even WWII had 'only' 55 million casualties. Unless we're talking global thermonuclear war that will not be a corrective measure.